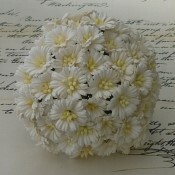 All of our mulberry paper flowers are handmade using natural, renewable resources. 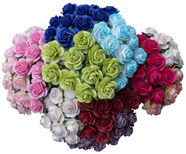 The flowers are all handmade by experienced crafts people using high quality materials and great care is taken to ensure that they are made to the highest standard. The production process does not involve using acid or other chemical additives. 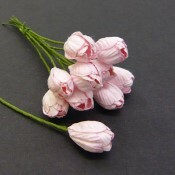 We are very proud of the quality and manner in which our flowers are produced, and the fact that they are made using natural, renewable resources. All of our mulberry paper flowers are handmade, which means that the manufacturing process is quite often slower than the mass produced, factory made flowers. We are the largest company selling mulberry paper flowers, and we stock very large quantities of flowers in all shapes, sizes and colors, but because handmade products are slower to produce, it may not always be possible to stock them in the required quantities, particularly during periods of exceptionally high demand. In general, the time to restock can vary between FOUR to SIX WEEKS - IF Wild Orchid Crafts is temporarily out of stock when we place our orders . So this means that we would receive the order approx. SEVEN to NINE WEEKS after we place our order. Please be aware that shipping on Wild Orchid Crafts Preorders will take from 1 month up to a little over 2 months to arrive. We will be placing our orders with Wild Orchid Crafts on the 1st of each month.